Late in July I spoke to the Association of American Publishers, Professional & Scholarly Publishing Division (AAP/PSP) in New York City. 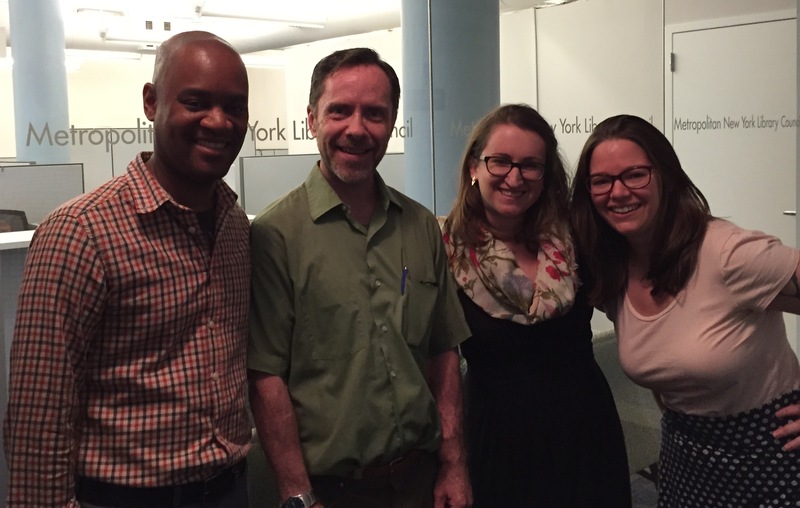 While in town to discuss scholarly publishing, our work at Los Alamos and developing tools, I had the opportunity to visit with SLA New York Chapter members. I began my visit at the Metropolitan New York Library Council (METRO), where my fellow SLA Board candidate Tom Nielsen and SLA member Davis Erin Anderson work. METRO is a library membership organization that provides services and training to regional information professionals. In addition to locally produced training and an annual conference, access to external training such as Library Juice Academy and Lynda.com are provided. METRO serves as a regional service hub to the Digital Public Library of America (DPLA). A METRO project, Culture in Transit, brings scanning equipment to smaller institutions to assist in getting collections online. These collections will eventually become part of the DPLA. Tom and I discussed the role of library organizations in advocacy and advocacy training, both of which are critical to the current and future success of information professionals and centers. We’ve all been told that most jobs are found outside the classifieds. So true! What is your story? What has been your path? I have many stories from my career, and will be sharing them in this blog series. For my first post I’m going to flash back to circa 1997, when I worked as an engineering librarian at Helix Technology Corporation, aka CTI Cryogenics. I was active with SLA’s Information Futurists Caucus, and decided to begin a discussion of Peter Schwartz’s Art of the Long View. The book introduces scenario planning, and caucus members joined me to discuss looking forward, thinking win-win, and understanding current culture and events to inform future context. Nearly a year later, while at MIT, I was contacted about a position at Weiden + Kennedy, an advertising agency. A member who followed the book discussion on the Information Futurists’ Caucus list wanted to know if I would be interested in applying for a position in advertising. I would have the opportunity to create a corporate library in a new facility. When I interviewed for the position, my prospective manager had a copy of Peter Schwartz’s book on his shelf. I noticed the title, and asked him about his connection with scenario planning. We spent the balance of the interview discussing the book, the author, and the Global Business Network. I became the Agency Librarian at Weiden + Kennedy, and my discussion of Schwartz’s title on the Information Futurists’ Discussion list had a direct impact on my career path. The take-away? Step up. Volunteer. Start a discussion. You never know who is listening!